Oh wow. Very good job. Yes you're totally right, but I don't think I have enough drive left to draw decoration. That's as far as I go with this tileset, I just can't draw decoration for my life, that or I would try to over-complicate them and end up with something awful. And hey, in NSMB DS Mountains and Volcanoes tilesets have no decorations at all (well granted mountains are supposed to be barren once you climb high enough). Correct me if I'm wrong but IIRC once a tileset has been accepted, everyone is free to ameliorate it by adding new tiles and what not. Ah, fine then. I just made a suggestion to make the tileset more season-ish. But then, I tried to make a level with it and I noticed that something nice related to Vivaldi could've been made. In other words, screw what I previously said and keep the tileset as it already is. 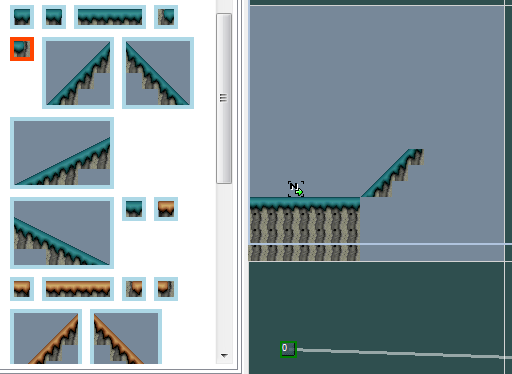 P.S: Before leaving the thread, could I ask a question about the tileset, that is...which tile am I supposed to use to "connect" the normal ground to the slope? Try to expand your slope so that it connects to the grass. If the grass is above the slope then good. If the slope is the one above the grass, it means that the slope was created after the grass thus has higher layer priority; you just have to delete the grass and create a new one, because the latest created tile always has the highest priority. Actually, you can use the page up and page down keys on your keyboard to layer . Neato I tested and it works. How the hell did you find that ? There are also icons for it in the top left corner, and if you put your mouse over them it will tell you the shortcuts . Please don't mind if I paste directly what I have in mind; IMO, way too bright. Alright, Ill fix that. But have you got any other suggestions? you didnt make that, these are the beta tilesets.